Click the big button below to make your own tipping competition. Import a sporting fixture for footy tipping, AFL and NRL tipping, Soccer and Cricket... and other sports. Current fixtures ready to import include: NHL Playoffs, Indian Premier League 2019, VFL 2019, FIFA Women's World Cup 2019, Netball World Cup 2019, NEAFL 2019, QAFL 2019, WNBA 2019, Overwatch League 2019, WAFL 2019, SANFL 2019, ICC World Cup 2019, Super Netball 2019, AFL & NRL 2019, Super Rugby 2019, NRL 2019, AFL 2019 and UEFA Champions League 2018/19. Best of all, it's all FREE! If you have any questions about creating games I would be happy to hear from you. Use the contact form to send your feedback. Below are some screenshots from an AFL footy tipping competition. Remember, these pages are customisable to fit ANY sport! There are two ways to set up your competition. 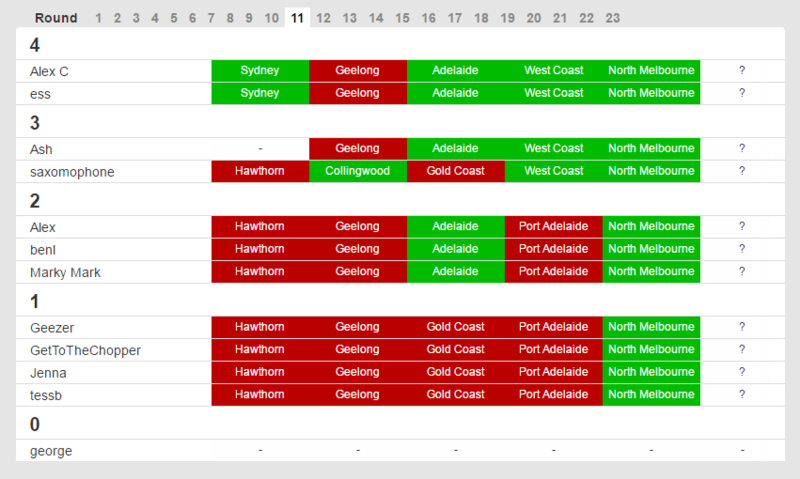 The first is to select the winners of each match, this works well for high scoring games like AFL or NRL. Tips may be entered up until each match starts. You can also set up your competition so that you enter the score for each match. This works well for low scoring game like football (soccer). Bonus points can be given for tipping the exact result. Leaderboard will show all competitors ranked by total score. 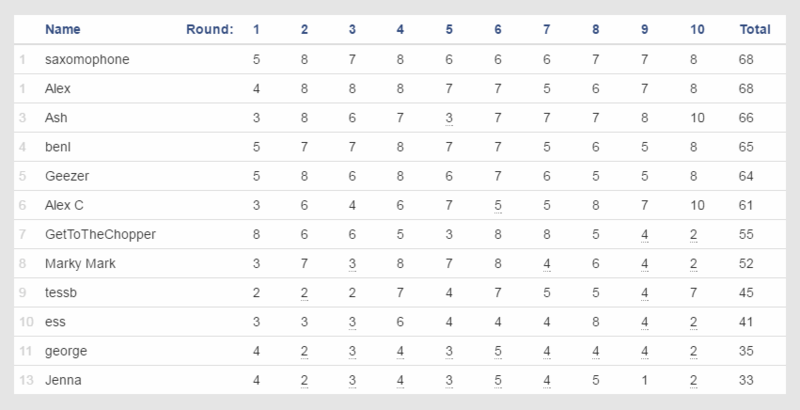 The round results page will show every user's correct tips and results for each round.